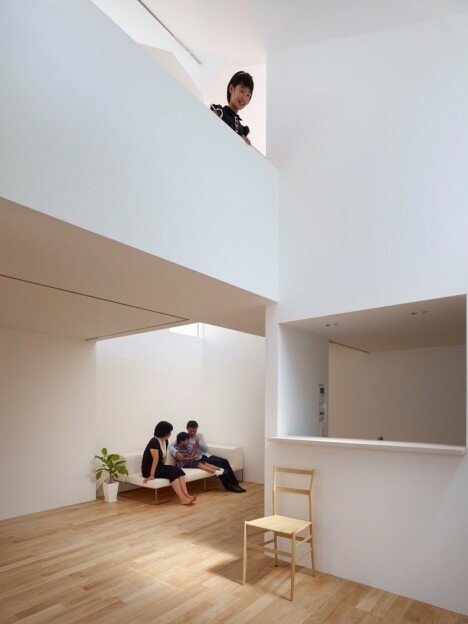 Expertly blending the minimalist aesthetics of traditional Japanese architecture with modern sensibilities to meet the needs of contemporary residents, architect Tomohiro Hata graces each of his cleverly-designed homes with his own distinctive style. 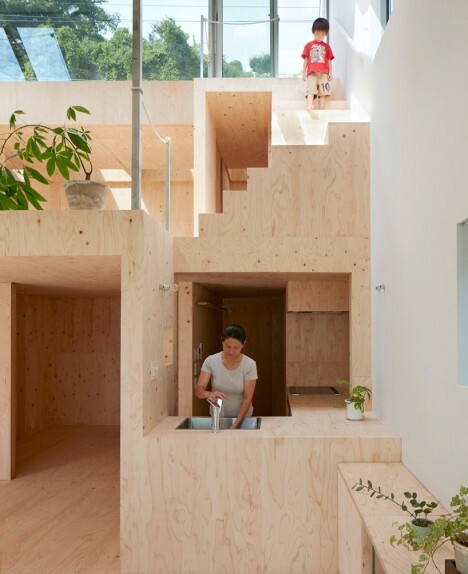 Haha is particularly skilled at producing sunny, airy residences that feel luxurious, dynamic and fresh despite tight budgets, challenging sites and building regulations. 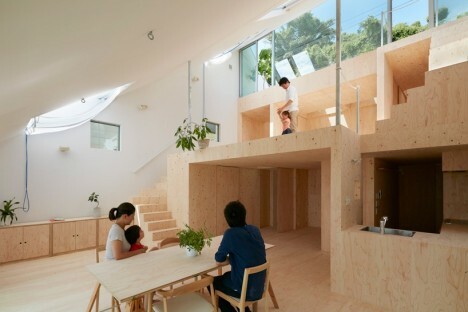 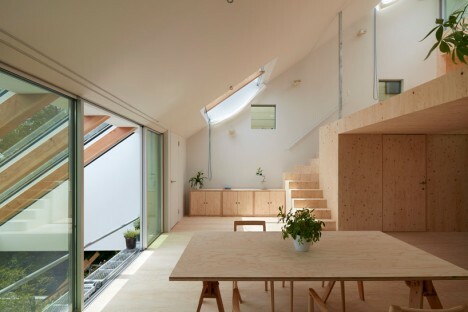 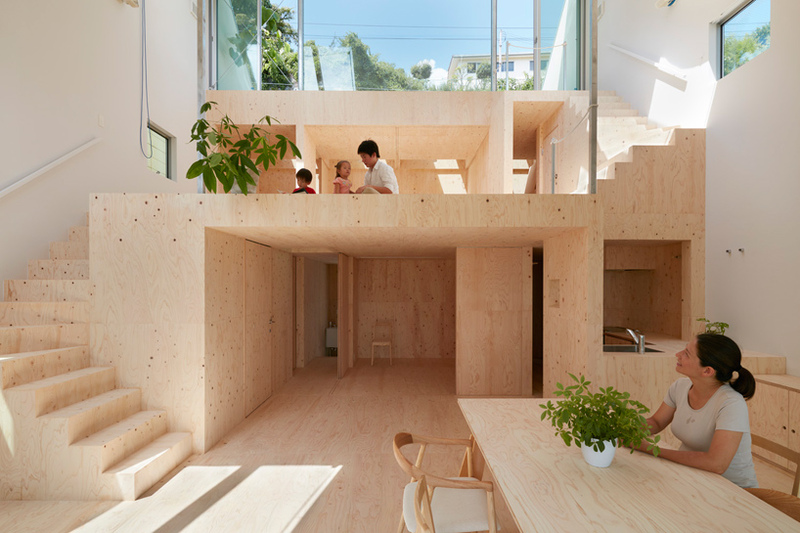 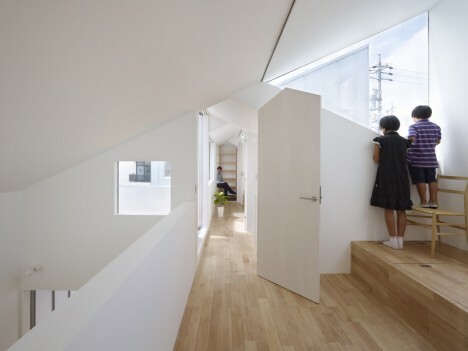 Modern Japanese architects have found creative ways to enable privacy in densely packed urban residential areas without cutting off access to sunlight, and to balance a cozy cave-like atmosphere in one part of the home with an airy, almost entirely open facade. 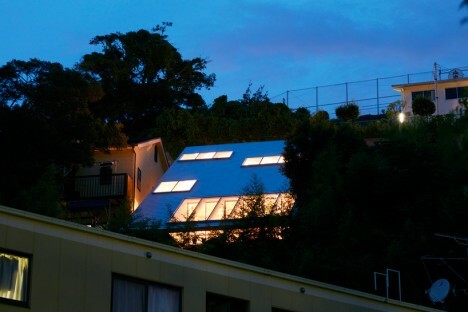 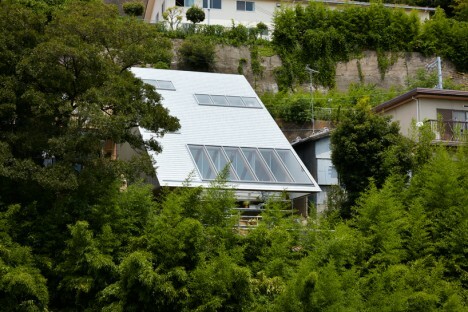 In the case of Tomohiro Hata’s ‘Re-Slope House,’ the plot is set into a rocky Kobe hillside, cutting off access to light and air in the back half of the house. 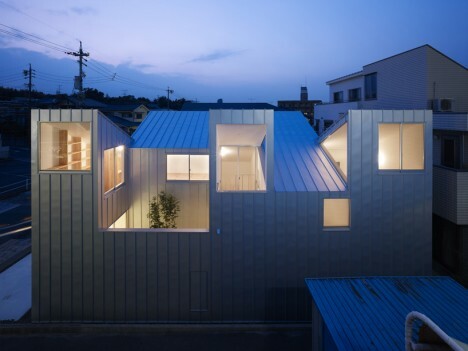 Hata’s adaptive design is a wedge-shaped metal volume that follows the slope of the hill, placing oversized windows at the front and inserting wooden platforms inside for varying access to the light. 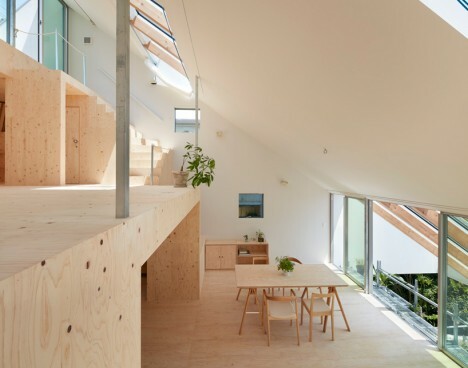 Three open-plan terraced platforms mimic an oversized set of stairs, stepping from a sunny room adjacent to the windows down into the more private rooms. 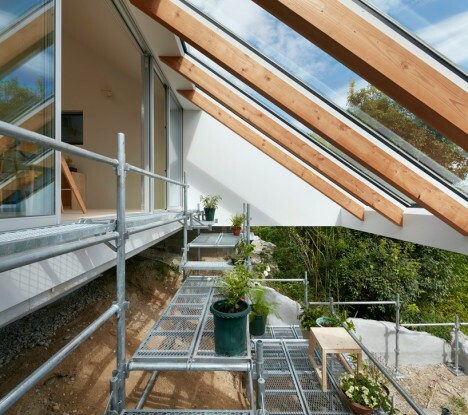 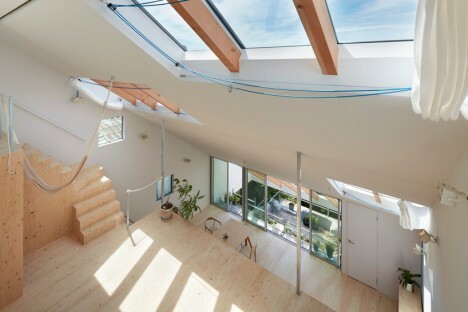 Skylights let the sun pierce through to the back of the home, and sliding glass doors offer access to a top-floor terrace and a set of metal scaffolding on the hillside for plants. 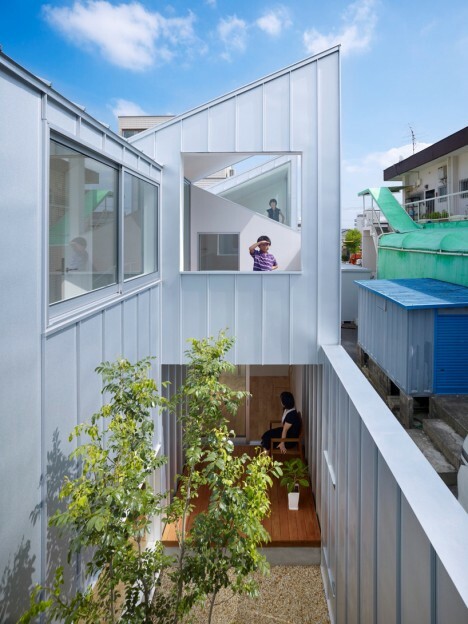 The street-facing facade is windowless; nearly all of the glass looks out onto the landscape, blocking the interior from the view of neighbors. 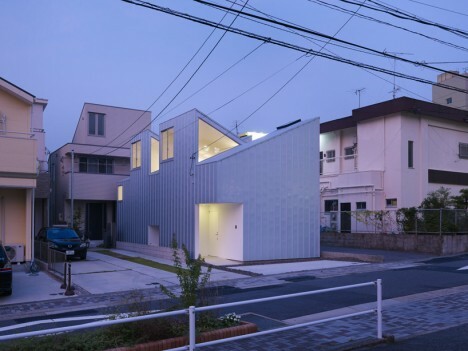 The narrow profile of this plot of land in Nagoya created a challenge for Hata in designing a single-family residence that feels open and spacious, yet also private. 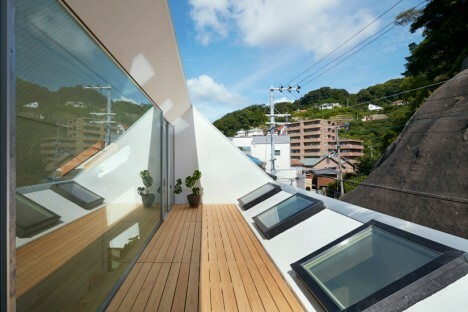 The architect’s solution was to create a sharply angled, jagged silhouette pointing most of the windows up to the sky. 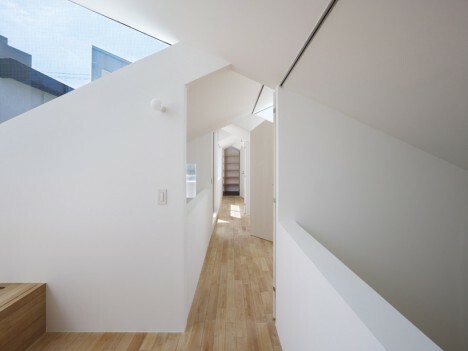 The series of voids created by alternating pitched roofs brings sunlight in from all directions at various times of day as well as entirely walled-in courtyards. 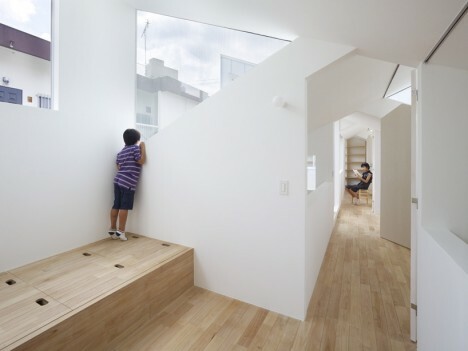 The clever layout lets the occupants look out without providing passersby with a view into their home, creates a dynamic flow of foot traffic inside and has a far more interesting appearance from the curb than a simple box. 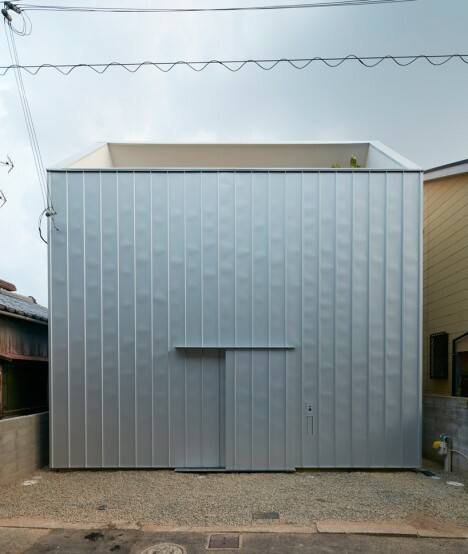 The use of simple metal cladding keeps costs down and gives the home a minimalist, streamlined vibe.